Some say bigger is better, but there is always an exception to a rule. Kirean is a great example of this. 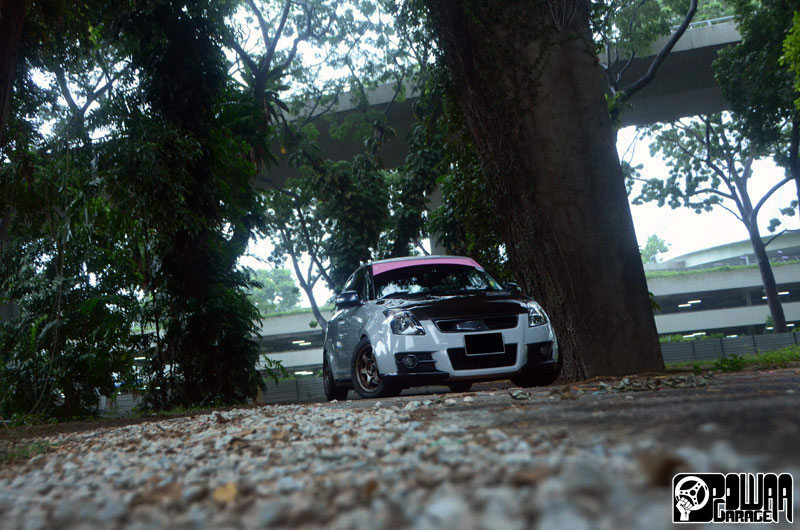 His first car was an ’07 Swift Sport, which he used as a proving ground for his driving. He then moved on to a 2.5L WRX which he extensively modified to hit a respectable 420 ponies. 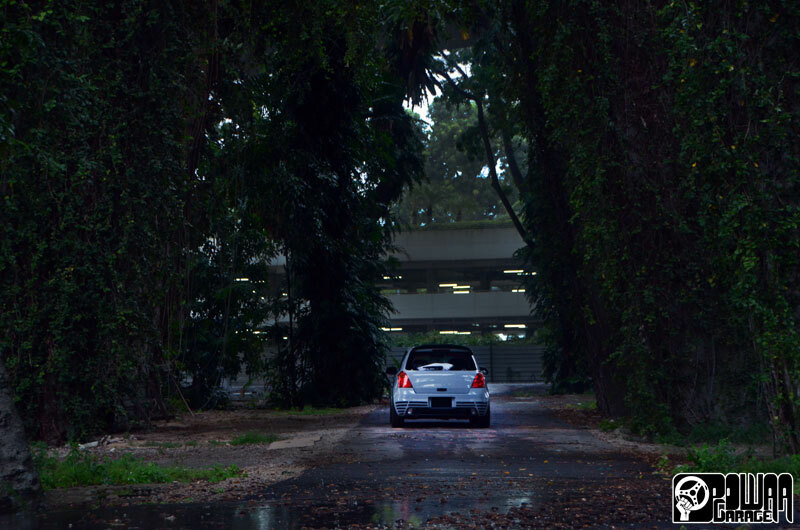 After driving his Rex for about 6 months, he made the surprising decision to go back to a Swift Sport. Some might call it downgrading, but he had his reasons – “although the power difference is major, the handling of a Swift Sports gave me the best driving experience I ever had,” states Kieran. “It’s a much more fun car to play with in Singapore, and maintenance is a lot easier.” He concludes. And the man proves that he knows what he wants: a fun yet affordable car to play with. 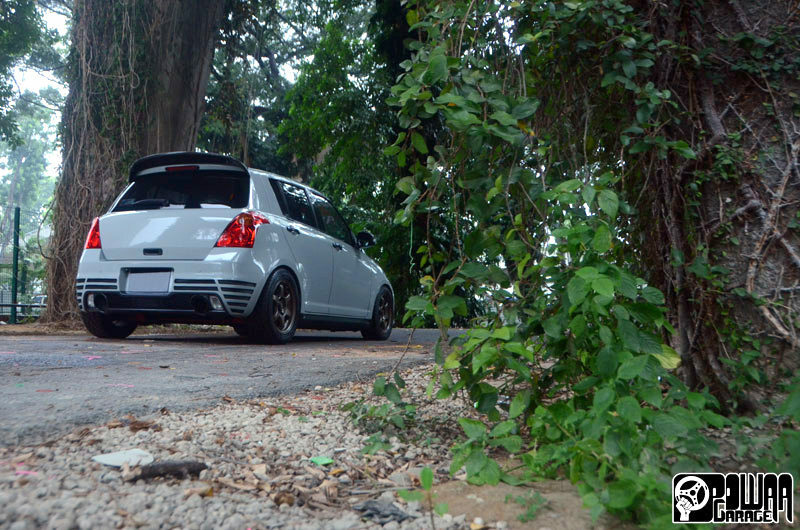 The Swift Sports is a good toy to own: it’s small and can be parked easily, and has a plethora of aftermarket support. Which is a good thing, because jumping down from 420bhp to 125bhp is a rather big drop. Kieran thought so too, thus like many of us out there, he started modifying his ride as soon as he got it. The first noticeable thing about this Swift is its colour. 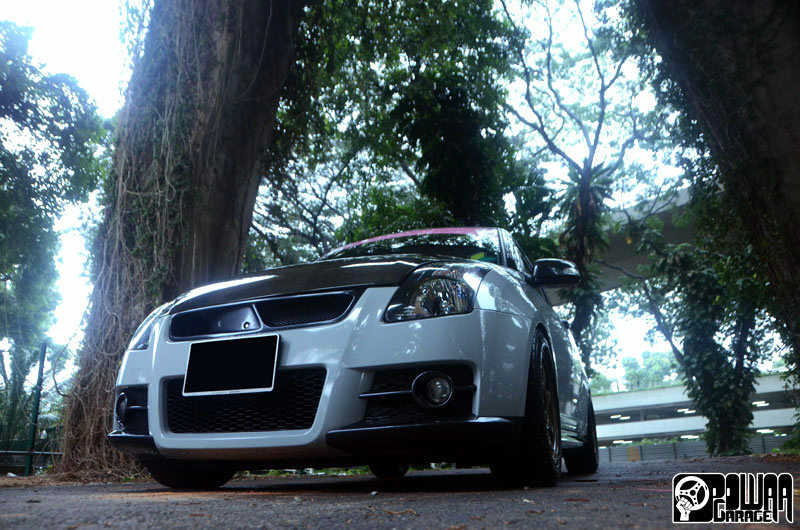 Not wanting to get the usual colours, and wanting to avoid the usual cookie-cutter stock canary-yellow Suzuki Swift Sports the car came with, he had his ride re-sprayed a befitting Battleship Grey shade. 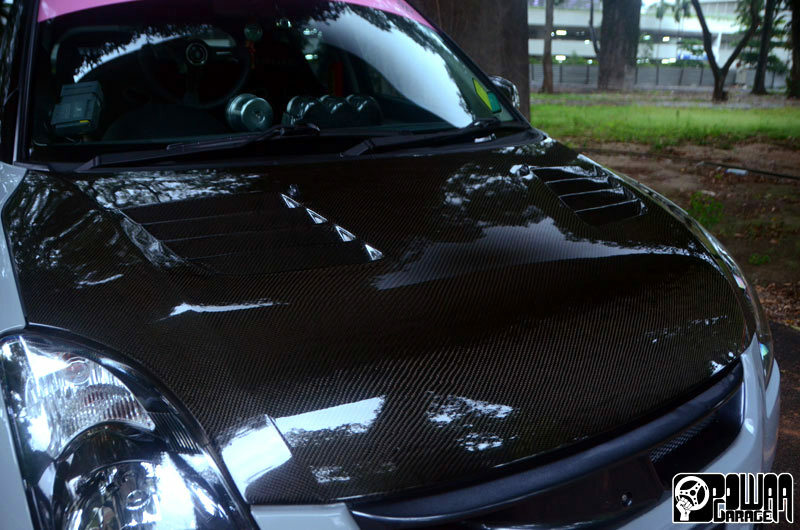 Next, Kieran improved the front looks of his Swift with a Charge Speed carbon fibre bonnet, sitting on top of a Bcrews’ front grille, while the rear received a Spoon carbon fibre spoiler. 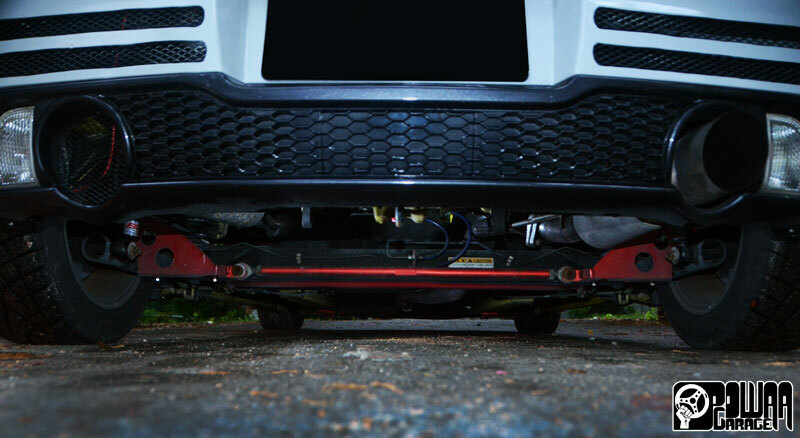 As much part of the aesthetics package as it is part of the performance upgrades, a Sunline Racing GTSpec 60RRS single outlet exhaust sticks out from the carved out stock rear bumper completing the looks of the Swift. 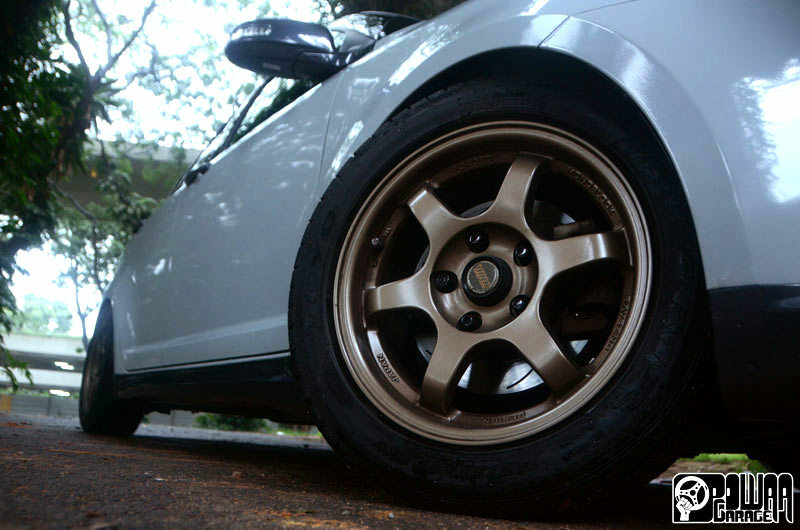 Kieran’s choice of kicks comes in the form of the popular Volks Racing TE37 in bronze colour, and shod in Toyo Proxies R1R. Behind the rims, the HD Teflon brake lines-equipped stock brake callipers are munching on HD slotted rotors with HD 0-500 degrees high performance brake pads for a strong and reliable stopping power. Jumping in the engine bay, the first thing that pops up is Choon’s customized big tummy air intake that seems to be made from Smurf skin. Its enhanced design helps to give a better air flow from the Blitz SUS Power Universal C3 air filter and the customized 57.5mm big bore throttle body. Kieran completed his intake package with a ported and polished intake manifold for a better atomisation of the fuel, leading to a better combustion and, of course, more power. What is not visible to the eye, though, is the work done under the metal skin of the engine block. If you were to open it up, you’d be greeted by a ported and polished engine head revealing an RRP stage 3 camshaft set dialled at 256° and 248° on the inlet and outlet respectively. Monster Sport reinforced valve springs, RRP lightweight valve lifters and a valve inner shims set provide the valves with the necessary support to handle the upgraded performance. 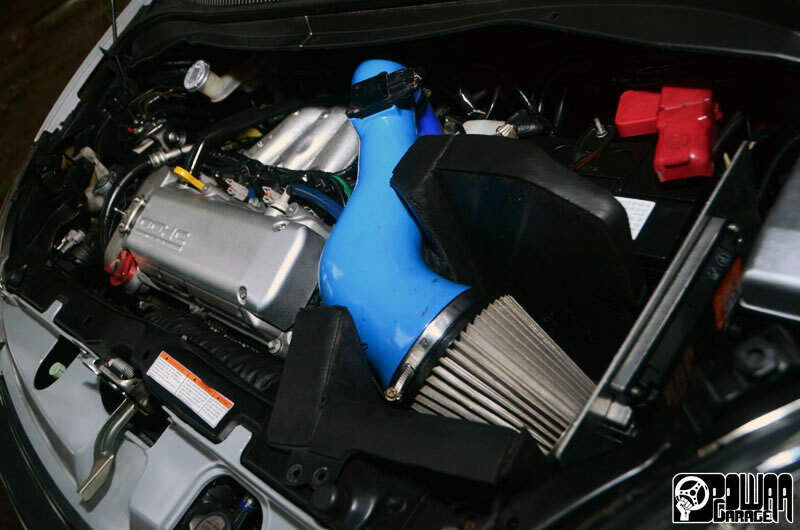 Kieran opted for RRP’s Super ROM ECU Version 2 (high cam spec) to manage the engine and enhanced the ignition with Okada Project Plasma direct ignition coils linked to NGK iridium IX spark plugs with NGK power cables for a reliable spark. He also threw in a Monster Sports water pump pulley, an RRP lightened crank pulley and an Ogura 4.3kg flywheel to reduce the load and increase engine response. Kieran then ensured the temps to stay within a reasonable range thanks to a Works Engineering Oil Cooler. The Suzuki Swift suffers from a factory glitch caused by the low temp thermostat, which makes the ECU believe that the engine is cold if the water temperature goes down to 80°C. This causes the VVT and electronic throttle functions to switch to cold engine mode and messes up the performance. Kieran tackled this problem with RRP’s middle temperature thermostat which keeps the water temperature between 80°C and 95°C for avoiding the cold engine glitch and giving an optimal engine performance. Adding power to an engine is one thing, but it’s useless if you can’t put it down to the road. Kieran knows this well, and to reduce the unavoidable power loss between the crank and the wheels, he decided to pay special attention to the transmission. He started off upgrading the clutch with and Ogura Super Single Clutch, complemented by an RRP clutch fork, a Project S reinforced clutch push rod, and a Project S lowered clutch pedal. Last but definitely not least, Kieran decided to address the gearbox’ cogs themselves. The most travelled path involves changing to a 4.7 final drive, which is a good idea, but Kieran is not one to follow the masses, as his unique paint job clearly states. He thus decided to go down the less travelled path with a 4.9 straight cut final drive and straight cut gears. Equipped with this, not only can he outrun those who opted for the most common mod, but he can also enjoy the whine of the straight cogs. 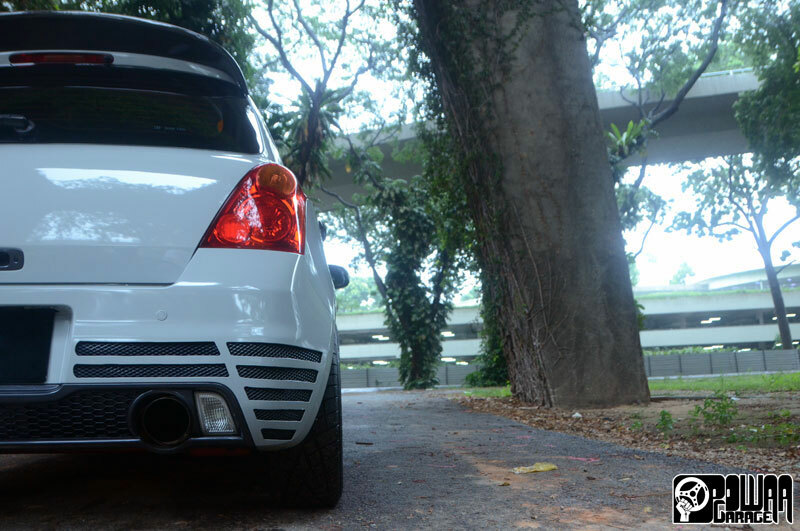 He completed the driveline mods with a Cusco type RS 1.5 way LSD to optimise the traction. You will hear it again and again, and one more time now: power is useless without control. Kieran knows this too, thus he made sure his car would stay planted to the black top at all times thanks to BC V1 coilovers with upgraded spring rates and an SPC camber kit for that extra grip in corners. He also stiffened the chassis with an army of bars made of RRP’s boot, rear passenger room, front lower, fender, and anti roll bars. With this, his Swift is sure to remain composed even at the limit. 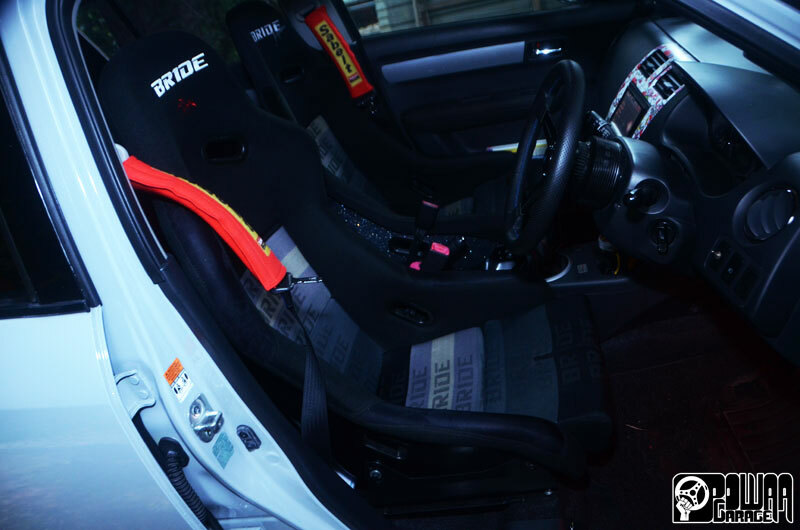 To make sure he stays in place behind the wheel, Kieran ditched the front seats in favour of a Bride Low Max for himself and a Bride Vios Japan for the passenger side. He also swapped the original steering wheel for a much nicer-looking Nardi 330mm semi-deep dish wheel mounted on an HKB boss kit. The Monster Sports gear knob sits at perfect height thanks to 833 Motorsports’ customized shifter extender. With the knob within instinctive reach, the Monster Sports short shifter is even easier and more fun to operate. 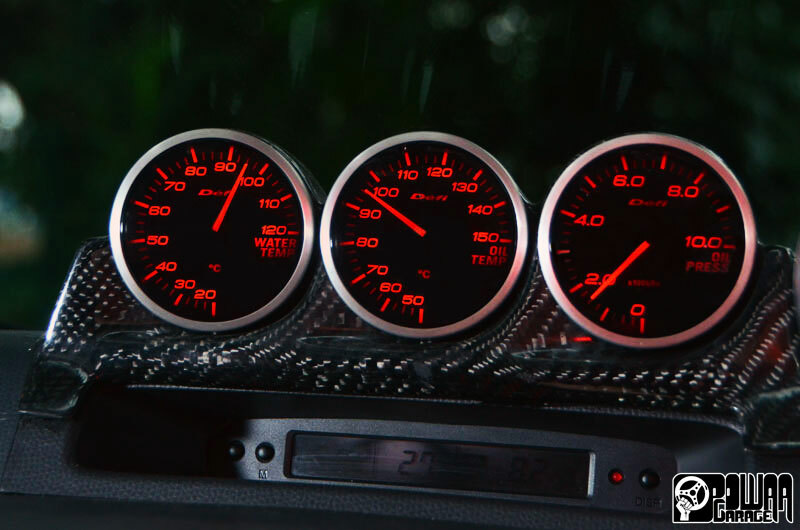 To keep a quick eye on the engine’s vitals, a custom Project S carbon fibre gauge console housing Défi’s oil temp, water temp and oil pressure gauges was added, while a tachometer with shift light sits by their side. 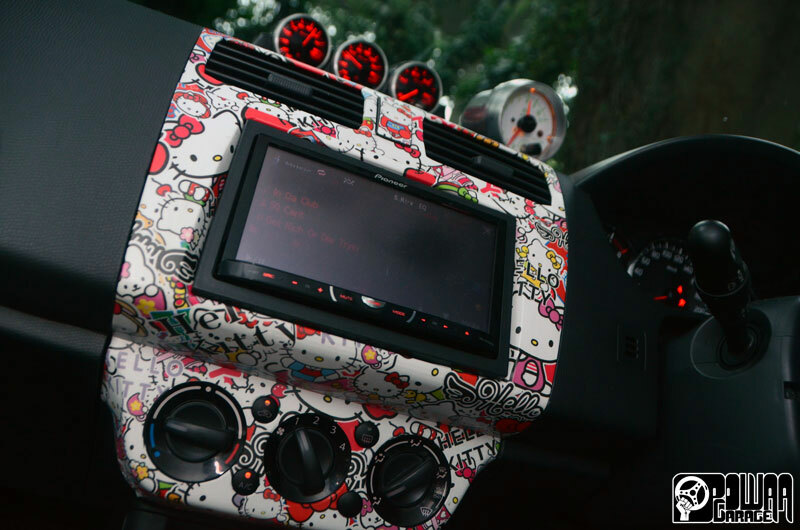 The final touch to this build is an ICE system headed by a Pioneer 3450 double din DVD player, which Kieran has framed with a cute touch: a Hello Kitty sticker bomb. The player feeds DLS front component speakers, DLS tweeters and Rockford Fosgate co-axial rear speakers through a JVC 4 Channel Amplifier, while a JVC Mono Block gets the Rockford Fosgate Punch 2 Subwoofer pumping the bass to complete the audio experience. Kieran is now satisfied with the way his Swift is, both mechanically and aesthetically, and plans on keeping it this way... Until the COE do them part. Unless maybe he gets new rims. Or maybe another power-adder? Oh well, you know the drill! “I would like to thank Project S and 833 Motorsports for the wonderful upgrades and knowledge you all shared with me. Eldred from 833 Motorsports will recommend you for mods and give you the best bang for the buck.